An early campaign – one of the first I wrote! 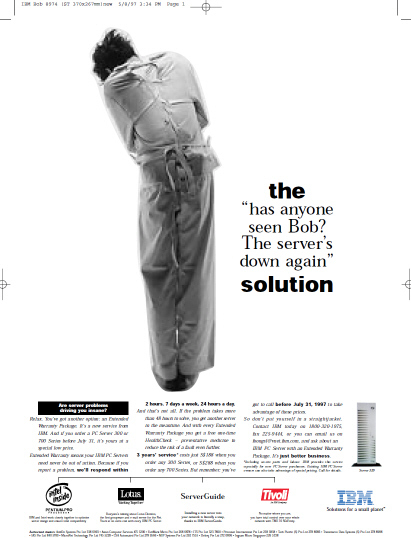 When Big Blue rebranded I worked on its first-ever truly global advertising campaign, based on big blue words. These three executions were where I varied the concept a little. 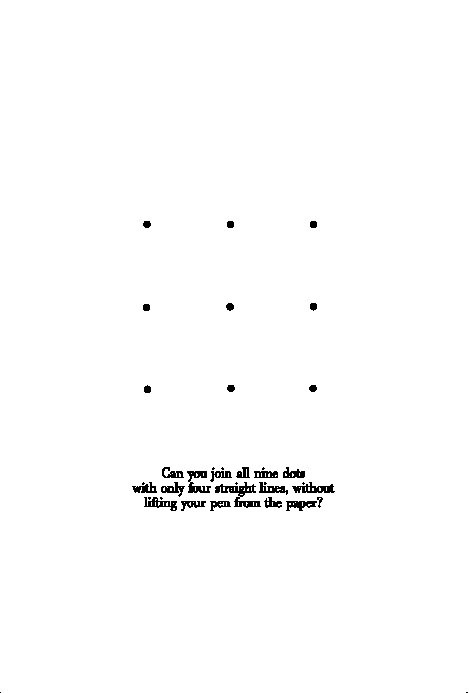 Head: Can you join all nine dots with only four straight lines, without lifting your pen from the paper? 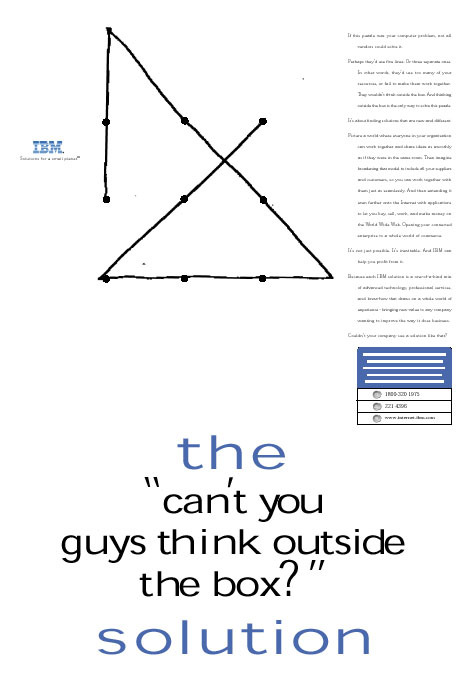 Copy: If this puzzle was your computer problem, not all vendors could solve it. Perhaps they’d use five lines. Or three separate ones. In other words, they’d use too many of your resources, or fail to make them work together. They wouldn’t think outside the box. And thinking outside the box is the only way to solve this puzzle. It’s about finding solutions that are new and different. Picture a world where everyone in your organisation can work together and share ideas as smoothly as if they were in the same room. Then imagine broadening that model to include all your suppliers and customers, so you can work together with them just as seamlessly. And then extending it even further onto the Internet with applications to let you buy, sell, work, and make money on the World Wide Web. Opening your connected enterprise to a whole world of commerce. and know-how that draws on a whole world of experience – bringing new value to any company wanting to improve the way it does business. Couldn’t your company use a solution like that? Copy: If you want all the parts of your network to fit together seamlessly, IBM can help. Because when it comes to compatibility – between different machines, different operating systems, different applications – nobody tops our experience. We squeeze decades of mainframe know-how into every single server solution we build, letting them coexist perfectly with your existing IT investment. Today IBM PC Servers let you work on an Intel platform with industry players like Microsoft, Oracle, SAP, Novell, and Lotus Domino. All working together peacefully and productively. And what’s more, they all come with TME10-NetFinity at no added cost. Systems management software that smooths network operations and lets you deal with dozens of servers and client PCs from one desk. There’s a PC Server Solution that’s right for you. And we’d like to build it. For more information visit us at http://www.ibm.com.sg. Call your local IBM Business Partner or contact IBM today on 1800-320-1975, fax 255-9444, and ask about PC Server solutions. It’s just better business. Copy: If this picture reminds you of your desk, help is at hand. It’s the new IBM PC300 GL, and it can help cut your workload down to size by making it easier to manage your system. How? Simple. Every PC300 GL includes a number of features that give you superior manageability. These include Wake-on-Lan technology and our new LanClient Control Manager. It means you can upgrade software, change BIOS levels, load software images and power-up every PC300 GL on your network from your own desk. 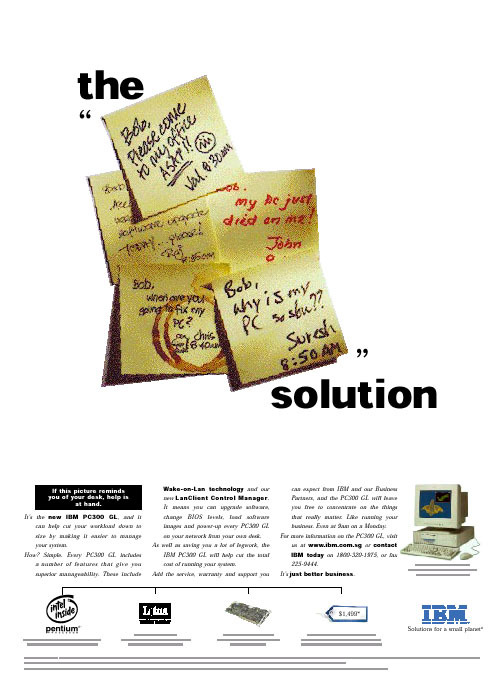 As well as saving you a lot of legwork, the IBM PC300 GL will help cut the total cost of running your system. Add the service, warranty and support you can expect from IBM and our Business Partners, and the PC300 GL will leave you free to concentrate on the things that really matter. Like running your business. Even at 9am on a Monday. For more information on the PC300 GL, visit us at http://www.ibm.com.sg or contact IBM today on 1800-320-1975, or fax 225-9444. It’s just better business. Copy: Ever wondered if there’s a way out of this vicious circle? George Lee at Sin Kwang Optical did. That’s why he called IBM. The problem? Sin Kwang already had some computers, but they couldn’t share information – making it hard for the company’s 40 people to work together. The solution? Connect every department to every other department, letting them use the same up-to-date data at the same time. The right solution for Sin Kwang was a midrange server with distribution and accounting software. 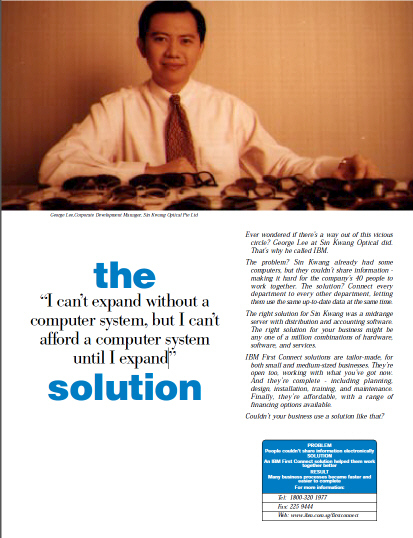 The right solution for your business might be any one of a million combinations of hardware, software, and services. IBM First Connect solutions are tailor-made, for both small and medium-sized businesses. They’re open too, working with what you’ve got now. And they’re complete – including planning, design, installation, training, and maintenance. Finally, they’re affordable, with a range of financing options available. Couldn’t your business use a solution like that? Copy: Are server problems driving you insane? Relax. You’ve got another option: an Extended Warranty Package. It’s a new service from IBM. And if you order a PC Server 300 or 700 Series before July 31, it’s yours at a special low price. Extended Warranty means your IBM PC Servers need never be out of action. Because if you report a problem, we’ll respond within 2 hours. 7 days a week, 24 hours a day. And that’s not all. 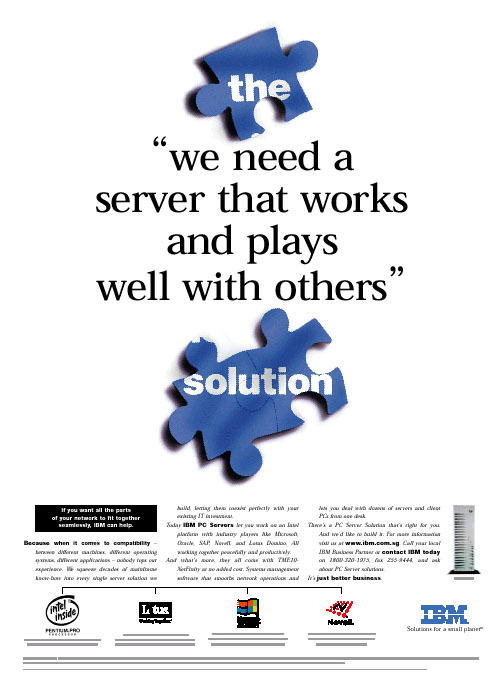 If the problem takes more than 48 hours to solve, you get another server in the meantime. And with every Extended Warranty Package you get a free one-time HealthCheck – preventative medicine to reduce the risk of a fault even further. 3 years’ service* costs just S$188 when you order any 300 Series, or S$288 when you order any 700 Series. But remember: you’ve got to call before July 31, 1997 to take advantage of these prices. So don’t put yourself in a straightjacket. Contact IBM today on 1800-320-1975, fax 225-9444, or you can email us on foongsl@vnet.ibm.com, and ask about an IBM PC Server with an Extended Warranty Package. It’s just better business.